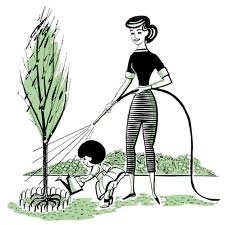 Watering is not always an easy feat even though, at first glance, it seems like a no brainer. Not only do you have to remember to water daily, but you also have to water effectively. If you’re not sure how to water your lawn or garden, not to worry: Here are some watering basics that will start you off in the right direction. When to Water – One of the biggest misconceptions in the gardening and lawn community is when to water. While it is safe to water you plants at any time of day, watering in the heat of a summer afternoon is neither cost effective nor environmentally responsible. Doing so results in a high percentage of the water evaporating before it reaches the ground. That being said, water your lawn or garden at dusk or early in the morning when temperatures are cooler and when plants are out of direct sunlight. This will allow more water to actually reach the root zone, resulting in less wasted water and high water bills. Read Your Plants – One of the most important skills you can learn is how to read your plants. Although blades of grass can’t talk, they can visually express whether or not they’re not getting enough water, or too much for that matter. If your plants are dehydrated, you’ll know. They’ll be wilted, the soil will be dry, and you’ll notice that your grass doesn't bounce back as quickly as it normally does. When you over-water you’re plants, you’ll notice small raised bumps on the undersides of the leaves, as well as increased runoff. Over-watering your plants is just as dangerous as under-watering; train your eye to recognize a distressed plant. Adjust Your Sprinkler – Using an automatic sprinkler system is easy; you stick it in the ground, hook up the garden hose, and let it run. While automatic sprinkler systems can be real time savers, make sure they’re angled properly as to not waste water. Re-adjust or re-angle your sprinkler system if you see any of the following: consistent runoff in a certain area, water hitting the house, water in the driveway, or water in the street or on the sidewalk.